Review: William J.Youngman's Headless Horseman project has created a new and exciting techno sound that was only an offshoot of EBM and industrial in years past. 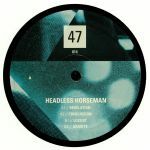 Stepping out of his own imprint, the dark horseman lands on Tommy Four Seven's excellent 47 label, tearing through the speakers from the get-go thanks to the toxic sounds of "Revelation", and the even nastier sway of "Concussion". Metallic and hard-nosed in absolutely every way, "Locust" follows up on that with a menacing pounce of beats and cavernous bass, while "Gravity" breaks the techno groove for something much more in line with the likes of Powell's Diagonal output. Big boy sounds.